The grammar and spellchecking in Papyrus is built-in and ready to use directly from the first start. Checking is available for English (General), English (US) and English (UK). You can toggle grammar and spellchecking in the status bar at the bottom of your window. A click on the dictionary icon turns checking on or off. The checking module runs in the background of Papyrus and continuously corrects spelling and grammar. The page you are currently working on is always checked first. It will then continue with the next pages silently without interfering with your work. This will make the working experience on concurrent pages more fluent. You can track the progress of the checking process at the bottom of the page in the status bar. If the checker is working, the dictionary icon will have a magnifying glass and a progress bar in it. When the currently visible text area is completely checked, a small green check mark will be shown on the dictionary icon. A grayed out dictionary icon indicates that the grammar and spellchecking is turned off. Checking can also be disabled only for part of the text. If checking is disabled in the current text area, the dictionary icon will show a red “X” . If the text appears to be written in a different language than the preset one (e.g. you have German text but “English” is set as the applying language), a yellow warning sign will be shown on the dictionary icon . Clicking the dictionary icon in these cases will allow you to turn checking back on again or switch the document language to English to re-enable checking. Grammar and spelling mistakes will be marked by wavy underlining. You can find the configuration for “Markup Colors” via “Preferences” → “Spell Checking.” By default, spelling mistakes will be marked in red, grammar mistakes in green. Words with wrong capitalization will have their first letter underlined boldly. This emphasizes that the error is only in the beginning of the word. If the checker has a suggestion for an alternative spelling, by default the error will be underlined wavily. Without a suggested spelling, the error will be underlined with dots. The easiest way to fix mistakes is to just go into the text and edit the area that is underlined. Maybe you would like to do more than just correct the mistake. Opening the context menu via right-clicking on the marked word will show you more options. Often, in the context menu you will be suggested an alternative spelling or an explanation of a grammar mistake. You can easily replace the wrong word with the suggestion by clicking on the suggested word. You can always click on the suggested alternative and Papyrus will switch the word in the text with the suggestion. errors as new entries into your user dictionaries. The dialog sums up all the info that you could find in the context menu when clicking on a mistake. It is easier to avoid repeat mistakes when you understand clearly what went wrong and why. The first step is to hover your mouse over a word that is marked as a mistake. A tooltip will appear with information about the error. Papyrus will tell you why it marked the text and in many cases recommend how to fix it. Hovering the mouse over the words will also display the description of the error in the status bar at the bottom of the window. The grammar and spellchecking for Papyrus is pretty reliable, but sometimes it will stumble over something unknown. You might have exotic names in your story, made-up verbs or specialist terms that are not in the dictionaries. What can you do when the marked word is in fact correct? The context menu of the underlined words will offer you different choices. You can tell Papyrus to “Ignore Here”. This will disable proofreading for that small part of the text and the marking will disappear. If the text is something that will be repeated throughout the document, you can tell Papyrus to “Consider Correct in Document”. Papyrus will add the words to a dictionary that is integrated in the document. All future occurrences of the term will then be considered correct in this document. To share your custom words throughout different documents, you can add them to a user dictionary. These dictionaries complement the word lists of our spellchecker. Your special words will then be considered correct across all documents you work with. For this purpose, please create a “New Dictionary…”. The default “English_additional.tlx” might be overwritten by us in future updates of Papyrus. This dialog allows you to check your document for spelling and grammar errors. You can open the dialog for searching and handling spelling mistakes from the “Document” menu, or by right-clicking on a word with a zigzag line beneath it and selecting “Check Spelling/Grammar” from the context menu. “Is correct” will tell Papyrus that this spot in the text should be marked as correct. “Is correct everywhere” will save the word in a list belonging to the document. This list ensures that Papyrus will not mark this word as incorrect again. “Add to” takes a word that you consider to be correct and adds it to the dictionary of the language you are using, so it will be recognized as correct in the future. The dictionary selection button will open the “Correction…” dialog under “Preferences.” Here you can choose which dictionary you would currently like to use. “Add all…” will take the words that have been marked as incorrect and add them all to the dictionary you are using. Before the decision is finalized, a small dialog will pop up, in which you can check to make sure that the selection is correct. This is a useful feature, allowing you to increase the size of your dictionary so that it contains terms specific to your text. “Replace” will replace the mistake in your text with the correct word you enter or a suggestion from the list. The “replace everywhere” button will do the same thing everywhere the error appears in your text. “Next” will jump to the next word in your text marked as incorrect and will display it in the “Text” field. When the auto correct is turned on, Papyrus will automatically correct certain mistakes recognized by the spellcheck as you type. Auto-corrected words will be shown with a box around them. You can undo the auto correct and restore what you have originally typed in the context menu . 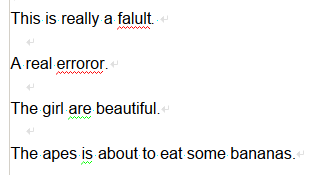 The spellcheck will then know to “ignore” this type of error in the future (this will be saved in the text style). The auto correct will capitalize any lowercase letters at the beginning of a sentence. If the first two letters of a sentence are capitalized, the second capital letter will be set in lowercase. (“IF the…” will become “If the…”). Letters that appear in the wrong order will also be automatically corrected. (“the wrnog odrer” will become “the wrong order”). In the context menu you can choose “remove auto correct mark,” which will remove the auto correct mark on that spot, or you can choose “remove all auto correct marks,” which will remove them from your entire text. If you edit a word, the auto correct mark will also be removed. Auto-correct marks will not be saved with your document, which means the spellcheck will be run each time you open the document. The first drop-down menu is where you can set the “default language” for Papyrus Author as a whole. 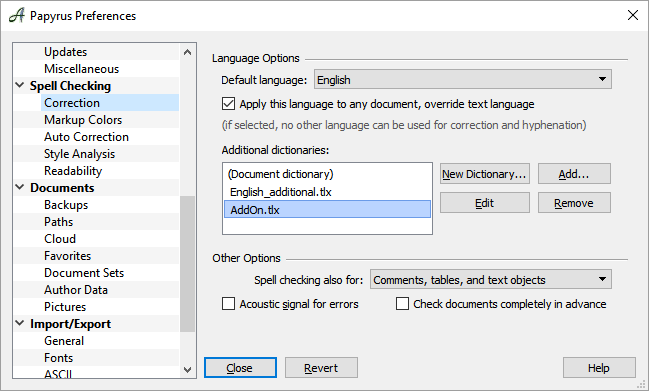 If the checkbox “ Apply this language to any document, override text language” is selected, no other language can be used. This is useful when converting because other programs, such as MS Word, often make mistakes in this area. 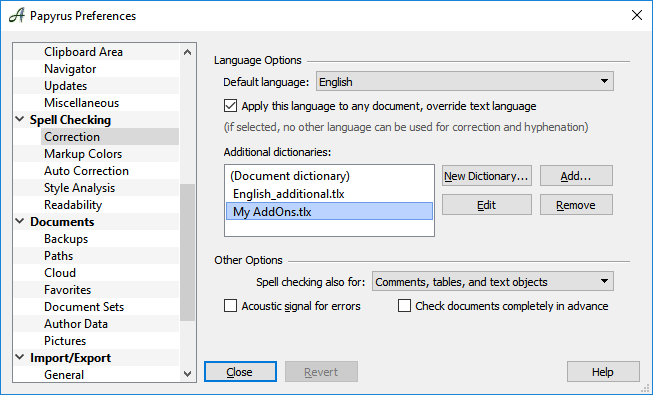 The language for a document or for text passages cannot be set here, but in the “Language and Hyphenation” dialog in the “Text” menu (as long as this checkbox remains deselected). You can also use “additional dictionaries.” To create a new dictionary, click on the “New Dictionary” button and give it a name. “Add…” lets you add an already-existing dictionary to the list. “Remove” will take a dictionary off the list (the file itself will remain unchanged). “Save” will save changes to a dictionary (for example if you add or delete entries when correcting). The drop-down menu at the bottom of the dialog allows you to decide what areas besides the main text you would like to be spellchecked–tables, notes, etc. Papyrus can “ Check documents completely in advance” which will run in the background while you continue to work on your text. 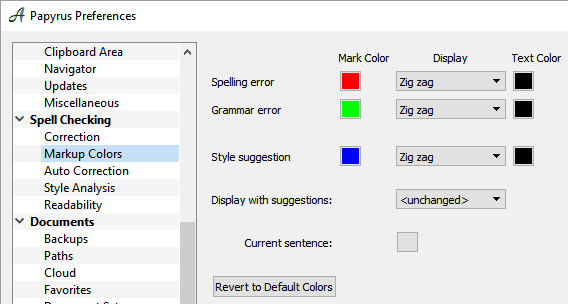 In this dialog you can choose various display options for the spellcheck, including the colors for spelling and grammar mistakes. How mistakes will show up in your text depends on whether the spellcheck appears with a suggestion in the context menu to improve the mistake or whether it recognizes a mistake without a suggestion. 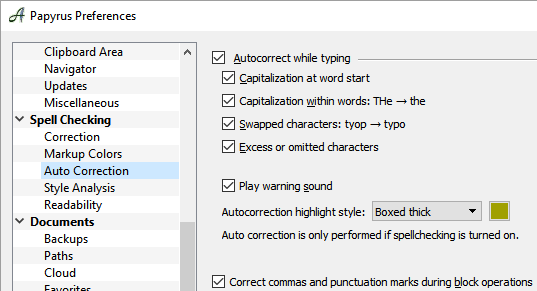 You also have settings to determine whether certain types of words will be included in the spellcheck: should the spellcheck look for foreign language words or words in a regional dialect and if so, in what color would you like them displayed? These categories include “ foreign words,” “ colloquial words,” words in a “ regional dialect,” and “ archaic words,” which are not readily understood nowadays. Single words will be checked as soon as you type some kind of white space (space, tab, return) or punctuation. A word that has been marked as wrong will be checked every time you change it. Spellchecking will be almost instantaneous, even when also checking grammar. When you complete a sentence with punctuation or leave the sentence by moving the text cursor out of it, the sentence will be checked in the background. Freshly edited sentences will always be checked first, ahead of any other checking on the page. Calculation fields or fields with special formatting in tables will not be checked. Should you be unsure whether something was checked right now, you can always force to “Update All” via Menu “Edit”→“Special”→“Update All” (CTRL+F12). This will re-check everything in the currently visible area. To avoid capitalization issues, headings like chapter titles should always use a style template for headings and titles. Papyrus will then easier understand why something is capitalized and how you used punctuation. Special characters at the beginning of a paragraph can sometimes prevent Papyrus to understand where a sentence ends. When the next word is capitalized as the starting word of the sentence, it might be marked as wrongly capitalized.